Battery Replacement Pack --- Compatible with MC-28 personal alarms. 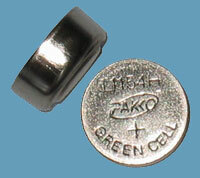 Mercury and Cadmium free button cell batteries work with most personal safety devices. Also replaces AG13, LR44, L1154, 357, LR44, D357, D303, SR44W, SG13 ... and many other button cell batteries.